27/07/2011 - "The 3 were sentenced to 3 years and 6 months, 3 years and 8 months and 3 years and 4 months, exceeding the demands of the prosecutor. The judge accepted the argument maintaining all the accusatory charges (preparatory acts of arson, illegal transport and concealment of material) excluding the charge of illegal trade (importing) in explosives. From 18 to 22 July the comrades were in solitary confinement in Lugano prison with new additional restrictions. Despite requests by lawyers, the trial, except for the testimony of two experts, was held in German. The lawyers had requested interviews with their clients after the verdict because they feared that not even the verdict by the presiding judge would be translated. But the three lawyers were stopped by anti-riot cops while the three were taken away in a hurry (under protection of a military helicopter). From the start, federal prosecutors and the judge revealed a willingness to come down relentlessly on the 3, as is obvious, the State will not tolerate anyone escaping its logic of delegation, submission and resignation, acting in first person to stop their project of dominion. "The militarization of the trial further emphasizes that it is politics that are directing this trial," said Marcel Bosonnet, one of the lawyers. Comrades from Switzerland and beyond came together to express their solidarity, giving life to a series of initiatives during the entire week. 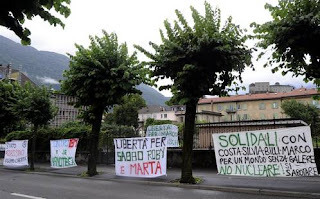 In addition to the scheduled debates there were demonstrations outside the court and the prison in Lugano, information bookstalls, leaflets, a presence downtown and spontaneous demonstrations in Bellinzona and Lugano, and other initiatives. The week was very eventful, solidarity broke the monotony of quiet days in Ticino, the trial has not gone unnoticed. Our presence in the city and initiatives enabled us to pass on our message, taking leading projects and responsibilities of IBM to the streets, repeating the need for opposition to the techno-industrial system. Against progress and nanotechnology, a roar shakes apathy! "